The Metabones Canon EF Lens to Micro Four Thirds Camera T Speed Booster ULTRA allows you to pair Canon EF mount lenses with Micro Four Thirds cameras and increases the effective field of view and the maximum aperture of the lens you're using. This is handy for achieving wider views with more dramatic depth of field effects on what is otherwise a sometimes uncompromising camera sensor due to its small Micro Four Thirds size. The Speed Booster works by shrinking the image circle of your Canon EF lens down to better fit the smaller sensor of Micro Four Thirds cameras. 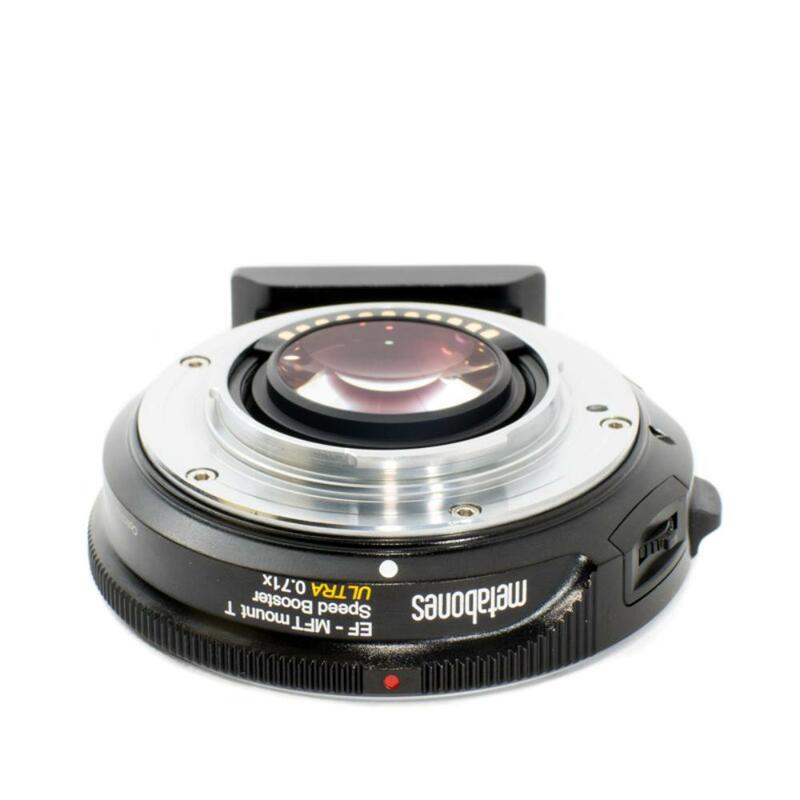 This has the effect of making the field of view of the lens 0.71x wider or, in other terms, reducing the crop factor of the camera from 2x to 1.4x. For example, your Canon 40mm f/2.8 STM lens becomes an effective 56mm with this Speed Booster on a Micro Four Thirds camera instead of the 80mm effective view you'd have with a straight adapter. This is closer to the APS-C view of 64mm for this particular lens example. Your Micro Four Thirds camera will render less like a Micro Four Thirds sensor and more like the larger APS-C or Super 35 sensor thanks to this Speed Booster, plus you have the benefit of using a wide variety of Canon EF lenses while retaining lens AF and image stabilization. 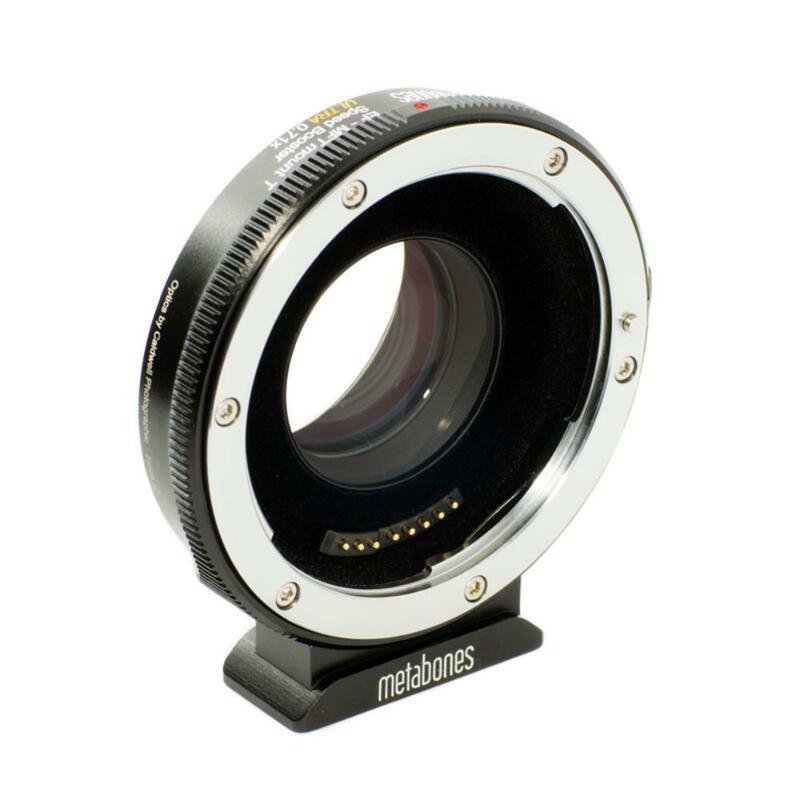 Metabones has designed particularly good AF support for Panasonic Micro Four Thirds cameras, such as the GH5, making this adapter a boon for GH series shooters wanting to use EF mount lenses. That said, Panasonic's video AF will always carry a risk of hunting longer with an adapter, including this one, versus the performance seen in native Panasonic lenses. 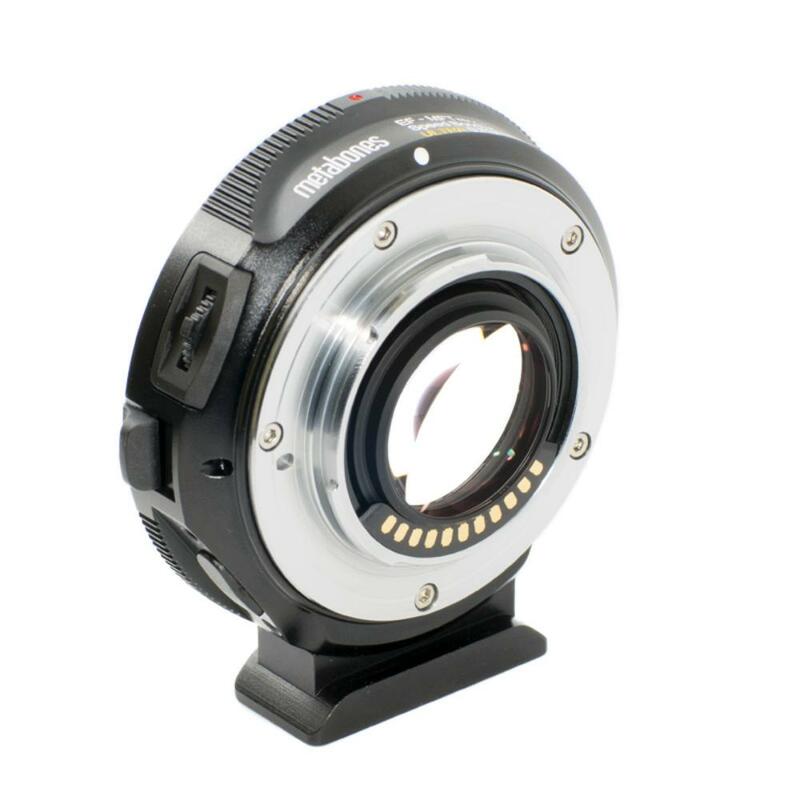 By concentrating the image circle from a lens, this Speed Booster also "brightens" the image – maximum lens apertures are increased by approximately 1 stop down to the sub-f/1.0 range. This Speed Booster is powered by the camera body or with optional 5V external power. Both the camera end and the lens end of this adapter are made of brass that are precision-machined and plated with chromium. It has a satin surface finish to match most MFT bodies and EF lens finishes. The Metabones Canon EF Lens to Micro Four Thirds Camera T Speed Booster ULTRA is a great tool for those using Micro Four Thirds cameras who want to also use a large selection of Canon EF mount lenses while getting that added benefit of a "boost" to both field of view and maximum aperture. For an interesting White Paper on how the Micro Four Thirds Speed Booster system works, please click here. • Autofocus is supported with this Speed Booster except on the Olympus OM-D E-M1. You may also see excessive hunting with Tamron lenses.